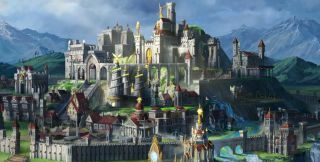 Ubisoft has announced that the second Might & Magic Heroes VII closed beta will run from August 26 to September 2, with no level cap and unlimited access to players who get in. The Haven and Academy factions will be joined by the Sylvan and Dungeon factions in the second beta, which will also see the addition of two new Skirmish maps, Fire & Blood and Irresponsible War. Access to the closed beta can be had by preordering the game, and Ubisoft will also be doing occasional beta key giveaways online. Uplay account holders can sign up for the waiting list and hope for the best. We—which is to say, Richard—went hands-on with Might & Magic Heroes VII back in March, and came away from the experience with a certain amount of ambivalence. "It can be difficult to spot the difference between a game that’s found its groove and one that’s a bit stuck in its rut," he wrote. "It’s too early to say which side Might & Magic Heroes VII falls, but it’s certainly a very, very familiar looking sequel." Nice trailer, though. Might & Magic Heroes VII is scheduled to come out on September 29.